Slogan: "The third largest privately held personal computer entertainment software company in America." 1370 Piccard Drive, Suite 120. Headquartered since 1990 in Rockville, Maryland, Bethesda Softworks LLC, a subsidiary of ZeniMax Media Incorporated, is one of the premier computer and console video game publishers and developers in the world, host to a wide variety of popular franchises, foremost of which is the renowned roleplaying game-line The Elder Scrolls. Bethesda Softworks was founded in 1986 by Christopher S. Weaver in the small town of Bethesda, Maryland. In homage to the town of its origin, the company was named Bethesda and soon began its illustrious career with the first physics-based sports games: the Amiga favorite Gridiron! football simulation. So impressive was their work in the field of physics-based engines, Bethesda Softworks found itself party to an offer from Trip Hawkins, then President of rival Electronic Arts, to become an affiliate in designing a new series of football games, John Madden Football. While the potential for success in such a venture - one which would become the backbone of EA's future - was obvious, the company chose to take a different approach to the market, partially by expanding their development into the novel world of roleplaying games. Thus, after years of work in genres ranging from sports, simulations, and first-person shooters, Bethesda initiated work on what was supposed to be an "action game with a little bit of role-playing on the side" (Ted Peterson, Interview 1) in 1992. Following two years of grueling development, The Elder Scrolls: Arena become an open ended role-playing game released in 1994. Based upon the original programming of Julian Lefay, Arena featured an expansive world of randomly generated environments, making for the largest world seen in video-games thus far. Still, despite the promised "large scale" world and other innovations - including first-person interactive combat wherein users were required to move their mouse in order to swing their sword - the game met with poor reviews, due to its unforgiving nature towards new players, who would often meet their death prior to leaving the first dungeon. Regardless of critical reviews, the game became a cult hit to RPG fans, forming a niche market of its own and prompting the development of a sequel. As such, Bethesda Softworks hustled to meet the demands of their fans, working furiously in conjunction with their new-found partners of 1994, Media Technology Limited - an international engineering research and development firm founded by members of the Architecture Machine Group at the Massachusetts Institute of Technology, of which Chris Weaver was CEO - to create a new engine for the game, the XnGine. With the new engine and the transition from a floppy-disk to CD-ROM medium, the second chapter in The Elder Scrolls series, Daggerfall, was released to the public in 1996. Expanding on the principles of the first game, Daggerfall featured a world of roughly 160,000 square miles - roughly twice the size of Great Britain - with over 15,000 towns, cities, villages, and dungeons for the player's character to explore, and more than 750,000 non-player characters or NPCs for the user to interact with. Continuing in the tradition of its predecessor, Daggerfall was widely accepted by RPG fans in general, but received numerous negative critical reviews. Having come with innumerable bugs both great and small, the game was often unplayable straight from the box; worse, many players found the game's very expansiveness a hindrance to their enjoyment, as a limited amount of textures and objects were used in its creation, despite the size of the world. Regardless of these issues, The Elder Scrolls series had officially become a well-known and standard part of the roleplaying universe, with plans for a further chapter's creation already underway. With the third chapter in development, and a fan base rabid for further adventures in Tamriel, Bethesda made an effort to expand their series without compromising the integrity of the central games. In that vein, Bethesda released the first in a new line of games, The Elder Scrolls Legends: Battlespire in 1997. Hoping to incorporate multiplayer elements in their future games, a program enabling such was drafted into Battlespire, running on the Mplayer system. The game, operating on the same engine as Daggerfall, met with minimal success and prompted cries for a "true" successor in the series. Ignoring the weak sales of Battlespire, and continuing in their hope of a new Elder Scrolls-based series, Bethesda released another non-central game in 1998, The Elder Scrolls Adventures: Redguard. While it too ran upon the same engine, the XnGine, Redguard brought to the series a fresh perspective, operating in third-person and set roughly 400 years prior to the events of Arena. The game met with far greater success than its spin-off predecessor, partially due to the inclusion of a manual addition packaged with such, entitled The Pocket Guide to the Empire, which is counted among the most widely read canonical literature to date. Continuing to develop and publish other titles following Redguard's release - in various genres - for numerous years, Bethesda began serious development upon the promised third chapter, previewing the title to audiences worldwide and calling it Morrowind. Bethesda's team when working on Morrowind. When Bethesda started work on Morrowind, the company was facing business problems. There were only six people left on the development team when development started. This eventually led to an aggressive takeover from ZeniMax Media Incorporated - a company co-founded by Chris Weaver himself - after they purchased Bethesda's companion-company of Media Technology Limited. 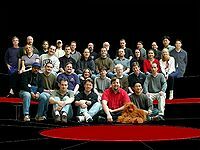 The buyout was completed in 2001 with an official amendment to the Bethesda Softworks logo - the inclusion of ZeniMax Media branding - allowing the company to continue its work with ongoing projects as a subsidiary outfit. Shortly thereafter, in early May of 2002, The Elder Scrolls III: Morrowind was released on both the PC and Xbox. Unlike the previous two games in the central series, Morrowind met with rave reviews and widespread acclaim, cementing The Elder Scrolls as a staple of the roleplaying genre. Similar to the previous installments, Morrowind featured a free-roaming world rich in atmosphere, and with the benefit of new technologies - including a new engine, NetImmerse, licensed from Numerical Design Limited - Morrowind included stunning vistas complete with real-time weather effects. Even more innovative, the free-roaming aspect of the preceding games was further enhanced in Morrowind, allowing the player to utterly ignore the central storyline and pursue whatever course they wished, and in whatever form as well, choosing from a variety of races. Furthermore, players were now able to freely switch between a first- and third-person perspective at any point in time. Such was Morrowind's popularity - bolstered on the PC with the inclusion of an editor, allowing clients to modify the game in whatever manner they desired with files known as "mods" - that Bethesda was all but forced to create official expansions to the title, coming in the form of Tribunal in 2002, and Bloodmoon in 2003. Each granted the player access to new areas tied to the region explored in Morrowind, introduced new characters, items, and spells, and further expanded the lore of The Elder Scrolls universe. The warm reception of Morrowind by the gaming community only bolstered Bethesda's resolve to continue The Elder Scrolls series, having begun work upon the fourth installment in late 2002. The project progressed - with numerous revisions - over a period of four years, under the able hand of executive producer Todd Howard, and was released in 2006 under the heading The Elder Scrolls IV: Oblivion. Oblivion retained the grand scale of its predecessors with a world larger than Morrowind's. Furthermore, with a custom-made version of the NetImmerse engine — renamed Gamebryo after NDL was purchased by Emergent Game Technologies — and using the advanced features of Havok, Speedtree, and FaceGen SDKs, Oblivion set new standards in graphics on every facet. Critics and players alike found something to be delighted in with the latest installment of The Elder Scrolls, although that is not to say that the game avoided negative commentary. Criticism of everything from the "leveled items and monsters" feature - which dictated various facets of the game, most notably both how and when creatures appeared, as well as what statistics were applied to items - the lack of crossbows and throwing weapons, removal of enchanting as a general skill, the fast-travel system (bereft of Silt Striders, Mark and Recall spells, Almsivi Intervention, Divine Intervention, Propylon Indices, and boats), and even the new "radiant AI" system. Nonetheless, Oblivion continues to sell well on both platforms of its initial release - the PC and Xbox 360 - having become the number one title on the latter, and receiving more than five "Best RPG" accolades on the former. So enthusiastic was the reception of Oblivion, that Bethesda soon initiated work upon two ports of the title, each with promised "new content", to be released on the PlayStation 3 under the same title, and the PlayStation Portable under the heading of The Elder Scrolls Travels: Oblivion. Sadly, after the initial announcement of the PSP version of Oblivion, there has been no official news for several years, and it is assumed to have been canceled. Skyrim released on November 11, 2011 (for an 11/11/11 release date) (8/12/11 for Japan), on PC, Xbox 360 and PlayStation 3 and kept to roughly the same size of its predecessor Oblivion. Skyrim ran on Bethesda's own graphics and gameplay engine: Creation Engine. Skyrim reportedly cleared more than five times the sales figures of Oblivion. Mysticism was removed from the game, and its spells reassigned elsewhere in the other magic schools, carriages were added as a fast-travel option and enchanting was re-added as a skill. Crossbows and spears where re-added later on by Dawnguard and Dragonborn respectively, thought spears are only usable by the players as arrows. Skyrim won many awards, including "PC Game of the Year" from IGN and GameSpot. More than four accolades of "RPG of the Year", and more than eight accolades of "Overall Game of the Year". After Skyrim was released three larger add-ons were released: Dawnguard, Hearthfire, and Dragonborn. Dragonborn was confirmed to be the last add-on for Skyrim. The Elder Scrolls Online was released on April 4, 2014 for PC and Mac, and June 9, 2015 for Xbox One and PlayStation 4. It was developed by ZeniMax Online Studios but published by Bethesda and it is the first MMORPG (Massively Multiplayer Online Role-Playing Game) game of the series, though not the first multiplayer game (see Battlespire). The Elder Scrolls Online is set across most of Tamriel as well as the Daedric realm of Coldharbour, though not all existing places are available for exploration in the game. Lycanthropy and Vampirism are only contractable through related quests. The Elder Scrolls Online required a subscription to play until March 2015. The game is now free to play after the initial game purchase, except that console players are required to have Xbox Live Gold or PlayStation Plus (a requirement by the console developers). The Elder Scrolls series has been continued over the years in mobile episodes—each entitled The Elder Scrolls Travels—with Dawnstar, Shadowkey, and Stormhold. While each was produced by Bethesda Softworks, they were externally developed by Vir2L Interactive, a separate division of ZeniMax Media. An in-house subsidiary of Bethesda Softworks LLC, the Bethesda Game Studios department is responsible for the development of games, thereafter published by Bethesda Softworks. It is for this reason that both the official Bethesda Softworks logo and that of the Bethesda Game Studios may be seen in certain titles. BethBlog - a regularly-updated blog containing all the latest news from the company. The Bethesda Podcast - an audio tour of important information, released every two weeks. The following tables detail those games created, developed, or published by Bethesda Softworks LLC. The following games are currently in development, or awaiting publishing, by Bethesda Softworks. It is imperative to note that games currently on this list may be postponed or canceled at any time. An official list of forthcoming titles may be viewed at the Bethesda development page. Esta página foi modificada pela última vez à(s) 11h55min de 28 de fevereiro de 2016.